Pete Wood's playing cards will probably change the way you think about playing card designs. Following the success of his Teddy Bear Transformation pack, Pete has produced another remarkable pack featuring 52 fully transformed playing cards in full colour plus 2 jokers. Pete reveals an original and eclectic approach to playing card design, but coupled with a sound understanding of the functionality and traditions in playing cards. We see his love of the natural world, particularly the insects, flowers, fruits and garden animals, plus an endless source of imaginative arrangements, patterns and animated illustrations on every card. Highy recommended. 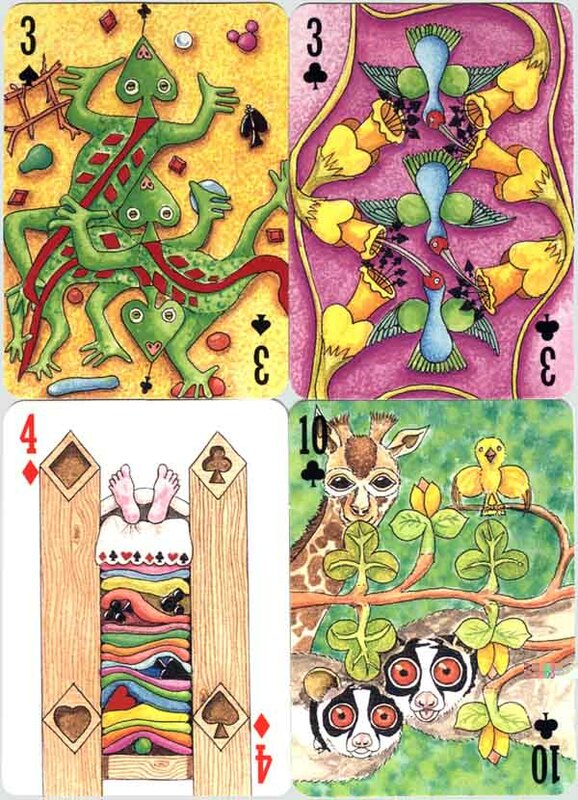 Above: four cards from Peter Wood's "2000Pips Transformation Playing Cards" printed in full six-colour process, which gives these playing cards the richness of an illuminated manuscript. Below left: one of the Jokers from the pack, designed by Pete Wood. Right: Jack of Diamonds.
' and click on 'Peter Wood'. To purchase a pack now contact Pete Wood. If you would like to have your own deck(s) reviewed on this website, please notify the Webmaster.